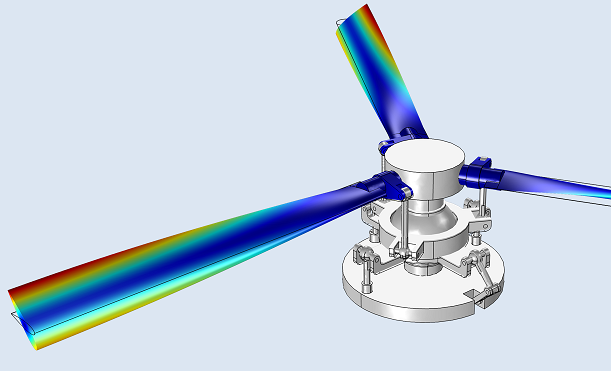 A swashplate mechanism, used in a helicopter to control the pitch of the rotor blades, can be easily simulated using the Multibody Dynamics Module available in COMSOL Multiphysics. 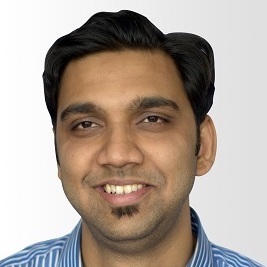 This module enables simulation of an assembly of flexible and rigid bodies, together with physical phenomena from fluid, heat, and electrical applications, among others. Here, we will show you a model to convey how a swashplate mechanism works and at the same time analyze the stresses and deformation in the flexible rotor blades. A swashplate is a device that is used to transmit the pilot’s commands from the non-rotating fuselage to the rotating rotor hub and blades. The fact that the rotor blades are rotating at a very high speed makes the swashplate mechanism’s task more challenging. The mechanism consists of two main parts: a stationary and a rotating swashplate. The stationary swashplate is able to tilt in all directions and move vertically. The rotating swashplate is mounted on the stationary swashplate by means of a bearing, and is allowed to rotate with the main rotor mast. A swashplate mechanism controls the cyclic and collective pitch of the rotor blades. The cyclic pitch of the rotor blades is used to change a helicopter’s roll and pitch. To tilt the helicopter forward, the difference of lift around the blades should be at a maximum along the left-right plane, creating a torque that, due to the gyroscopic effect, will tilt the helicopter forward instead of sideways. This is accomplished by tilting the swashplate assembly through pushrods. Collective pitch of the rotor blades, responsible for the average lift force, can be changed by moving the swashplate assembly vertically without tilting it. The Multibody Dynamics Module provides pre-defined features to establish various types of joints between components. In this model, different components of a swashplate mechanism are connected together using Ball, Hinge, Prismatic, Cylindrical, Planar, and Reduced Slot joints. The connections in a swashplate mechanism are positioned in such a way that components form a closed loop — the swashplate mechanism is thereby a good example of a closed loop multibody system. If you were to model all the components as rigid, the mechanism would become overly constrained and difficult to simulate. This is not the case if you model it in COMSOL Multiphysics; the constraint elimination process removes the redundant constraints from the system. The animation above shows the workings of a helicopter swashplate mechanism. A transient analysis is performed to analyze the workings of the swashplate mechanism. Our specific interest in this case is finding out the effect of cyclic and collective pitch, given through the swashplate mechanism to the rotor blades, on the angle of attacks of rotor blades that in turn affects the generation of lift force. In terms of flexible rotor blades, lead-lag and flapping phenomena are also demonstrated. An eigenfrequency analysis is performed to find the rigid body modes and eigenmodes of a swashplate mechanism with flexible rotor blades. corresponding to this mode is close to 185 Hz. Check out our Helicopter Swashplate Mechanism model for more information. If you log into your COMSOL Access account you can download the documentation for this model as well.